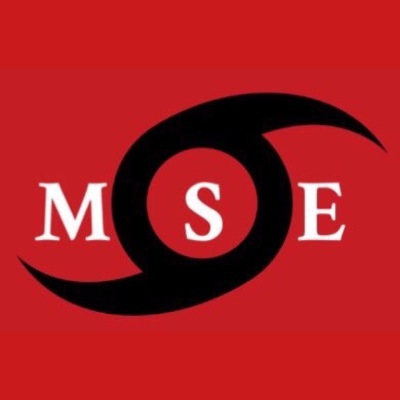 Tryout Information for the upcoming 2019 Middle School Spring/Summer Travel Season is now available. We hope to see you in the building. *If you are a 6th Grader with an advanced skill set feel free to attend. We will be adding a 6th Grade team in the near future. Tryout Information for the upcoming 2019 High School Travel Season is now available. We hope to see you in the building. *Registration begins at 1:45 p.m.
Our 2018 Travel Season was one for the "books." All of the teams in our Program were productive and players from every team garnered the attention of college coaches. Our 2020-Simpkins team started the year off on fire by defeating EYBL teams and by defeating other local teams considered to be among the best in Michigan. His team was eventually decimated by injuries but, when healthy, demonstrated that they could compete with anyone. Multiple players from his team are being recruited to play college basketball and at least two hold Division 1 offers. Our 2019-Hughes team was very impressive as well. This group of girls had never played together before but always competed well at tournaments. At least one player accepted a Division 1 scholarship and others will undoubtedly play at the next level. Coach Hughes was our "Coach of the Year" in the Program. The 2019-Love Team competed at every event that they entered and had an impressive record at the end of the season. A number of players from that team will play college basketball and they at all times represented us well while on the road. 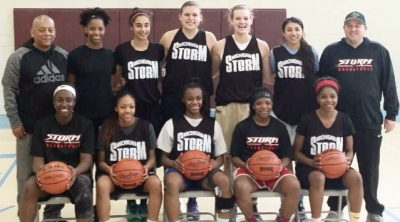 Our Storm 2021-Horne squad started off the year slowly but built momentum throughout the season. This was no surprise as these young ladies were all new to each other and were playing catch up. Two young ladies on that squad picked up Division 1 offers and several others are being recruited at that level. This group is expected to do big things in 2019 as their chemistry will already be established and new critial additions will join the family. Additionally, our 2021-Stillwell squad focused on individual skill development in 2018 and the growth of a few players was evident by the end of the season. Our 2019/20 TNT team had a phenomenal year. 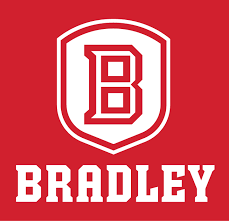 They went undefeated to complete the first half of the year and won a tremendous battle against one of the top teams in the United States to win the Classic. The team also captured the Michigan Cup -- an event billed as one to give bragging rights to the "best" team in Michigan. This group went on to win other tournaments and had all of the departing Juniors/Seniors commit to Division 1 Programs. 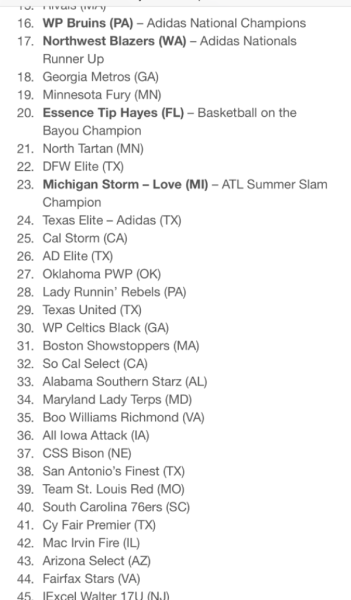 At the end of the season the Michigan Storm was ranked as being the Top 12 Program in the United States. In short, 2018 was a great year for our Program. Stated a different way, we handled our business in 2018 and put the nation on notice that Michigan could not only "compete" on the big stage, but that we were capable of winning and dominating. We are proud of the season that we had and are eager to leave our mark in 2019. Like past years, this year was no different for our Storm players during the high school season. They simply lit it up and have been honored for their efforts. We had a number of players named to various All-State, All-Area and All-Conference teams. Quite a few Storm players were represented at the State Championships this year as their teams battled for titles. 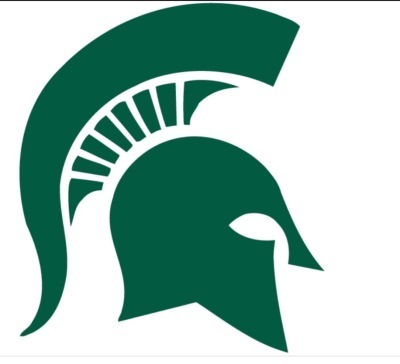 Indeed, we had players from Saginaw Heritage, Detroit Edison, East Lansing and Detroit Country Day battling for State Titles. We are proud of their efforts and have summarized some of the lists below. BCAM BEST CLASS A: Grace George, Taylor Williams, Aaliyah Nye, Shine Strickland, Olivia Moore, Janara Flowers. 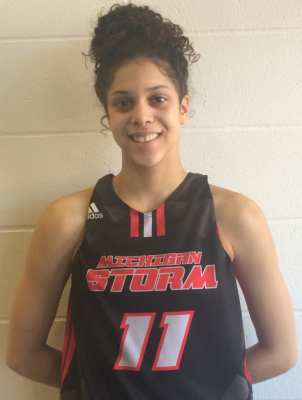 For the second consecutive year a member of our Storm Family has been named Miss Basketball for the State of Michigan. Congratulations Jaida Hampton. Jaida has been with us since her 9th grade year and has improved her game every year. 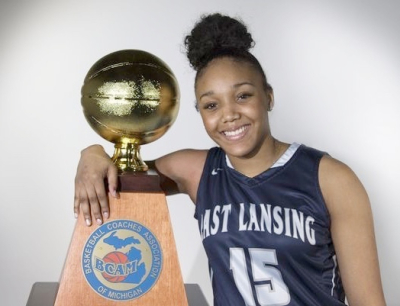 Jaida has led her E. Lansing team to great heights during her high school career but has done so in a quiet and unassuming way. She has never demanded the spotlight and is always happy when her team wins, regardless of whether she is the leading scorer or not. 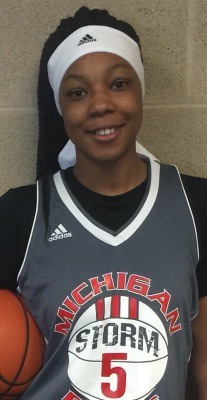 Jaida has competed against some of the best players in Michigan as well as some of the top players from around the United States over the past three years. She has left her mark with her high school team and with our Program. We celebrate Jaida's accomplishment and we are fortunate to call her a member of our Family. Way to hold it down Jaida.....Back to Back! We were thrilled last year when Jordan Walker was nominated as a Miss Basketball Finalist and were overjoyed when she was announced as the winner. Her Storm sisters have had productive seasons and two were listed recently as Miss Basketball Finalists. Jaida Hampton and Lasha Petree have had outstanding high school careers and have been with us since their 9th grade year. We could not be more proud of them and, regardless of the outcome, we celebrate the fact that they have been recognized as being two of the four best players in Michigan for the Class of 2019. Congratulations ladies! A number of preseason lists were published listing a number of Storm players as being among the best in Michigan. One such Top 100 list had nearly 30 Strom players mentioned. The most recent list, which was based on in-season performances, listed a whopping 11 Storm Players as being in the Top 30 in Michigan. These players have earned the recognition with their hard work and production. In addition to these players a number of other family members who could have appeared on that list will likely end up being recognized as All-State performers. Congrats to Gabby Elliott, Janara Flowers, Grace George, Jaida Hampton, Moira Joiner, Ellie Mackay, Lasha Petree, Sydney Shafer, Shine Strickland, Destiny Strother and Taylor Williams. 2017 was a banner year for the Storm. Our girls represented themselves and the Program extremely well as they competed in tournaments around the United States. A number of titles were won and a ton of scholarships were earned. Every player on our 2018 (Love) team will play college ball and they ended their summer with a bang. 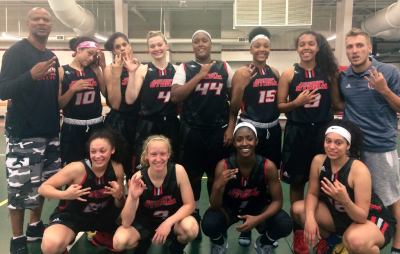 They defeated two EYBL teams at the PSB Elite 32 Event in Atlanta on their way to another summer Title. 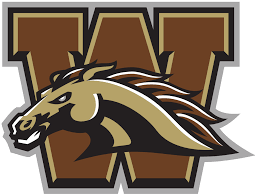 Our 2019 (Brown) team was very competitive and were gelling extremely well before injury and attrition set in. They won (or shared) several titles this Spring and Summer. Our 19/20 (TNT) squad won a number of Titles and every player from that group has earned offers from Division I schools. The group did not lose a pool game all year and made the championship game of every tounament that they entered except two -- those two they lost in the semifinals. The group was considered by some to be a Top 5 team nationally and earned titles at the PSB Elite 32, Deep South (playing up), ASGR Summer Playoff, USJN Memorial Day Classic to name a few. Our 2020 groups were very impressive. 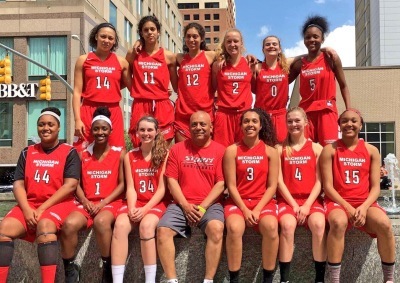 Coach Simpkins' and Hawkes' teams competed at an extremely high level and won or shared a number of tournament titles -- among them, USJN Windy City, USJN Memorial Day Classic, Cagers Invitational. Kudos ladies! 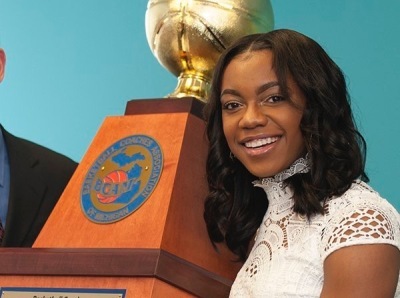 We are extremely proud that one of our own, Jordan Walker, was named Miss Basketball for the State of Michigan in 2017. 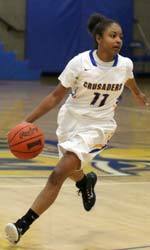 Jordan came to us after suffering an ACL injury following her Sophomore Season. Her faith, determination and hard-work allowed her to return to the Court for her High School Junior Season. She was fantastic. During the AAU season Jordan was a huge part of our success as we defeated top notch opponents from around the United States and won several prestigious tournaments. Jordan became the All-Time Leading Scorer at Mona Shores as well as their All-Time leader in Assists. This young lady is as tough and determined as they come and we are grateful to have her in our family. In addition to her stellar basketball career, Jordan is an outstanding student and is extremely active in the community. She is a born leader and is destined for success in the future, on the court and beyond. Jordan.....congratulations from the Storm Family! The preseason lists were a precursor and suggested that our girls were expected to have great seasons. They outperformed expectations. Although all of the All-State Lists have not been released yet, our girls racked up the honors. From Miss Basketball, to Players of The Year, to Dream-Teamers and All Staters galore, Storm girls represented. We are proud of these young ladies. Connect by clicking the link below or simply go to our News Page/Tab. When we started our Program we were determined to provide young ladies who were serious about the game an opportunity to be seen by college coaches. We make no qualms about the fact that we are interested in attracting young women who are serious and committed to play at the next level. It therefore gives us incredible joy to watch our former players perform at the next level. A number of these young ladies have hit the ground running and are having impressive college careers to date. A few of their performances will be highlighted below. 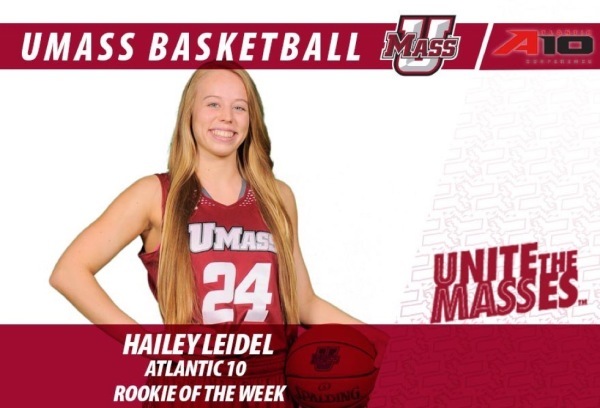 Hailey Leidel has simply hit the ground running at U Mass. Hailey has twice been named the Atlantic 10 Conference Rookie of The Week and currently leads the Nation in scoring for Freshmen. Hailey has always had a tremendous work ethic and is extremely tough. We are extremely proud of Hailey. Jalisha Terry is a fighter who has the skill to match her will. Jalisha's early season production led to her being inserted in the starting lineup and she has not looked back. She has run the PG spot for St. Bonaventure like a veteran and has twice been named the A-10 Rookie of The Week. St. Bonaventure got a good one.. The "Big Cat" had an outstanding Freshman campaign at Marquette and she hadn an even more impressive Sophomore campaign. 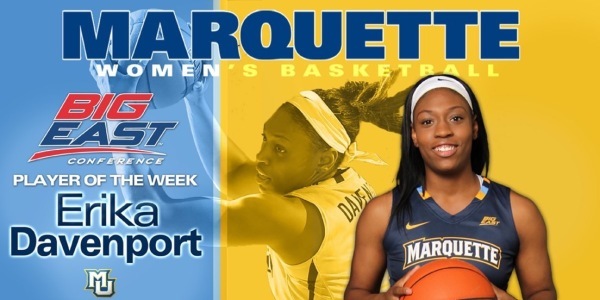 Erika led the Big East Conference in Double Doubles this year and was an integral part of Marquette's success. Marquette won the Big East Tournament and earned an NCAA Tournament bid. Marquette has knocked off a number of Top 20 teams this year. Erika was named All Big East - 2nd Team and earned Player of the Week Honors this season. Playing in the Big Ten is tough and grinding, especially for Freshmen. 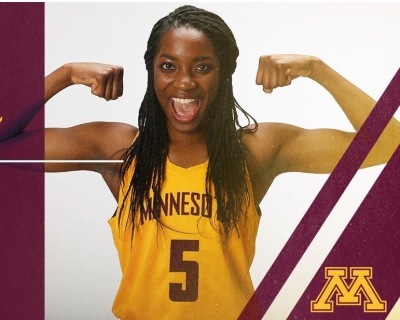 Taiye Bello showed early that she will be able to make the adjustment -- she recorded 10 points and 12 boards in her first college game. Taiye has already earned several starts and recently posted impressive numbers for Minnesota. She notched 19 points and 8 boards versus Penn State. This young lady has a bright future. Kris Nelson is a silky smooth guard with an extremely high basketball IQ. She is versatile and has outstanding court vision. Her playing time has continued to increase because she is simply an asset on the court. 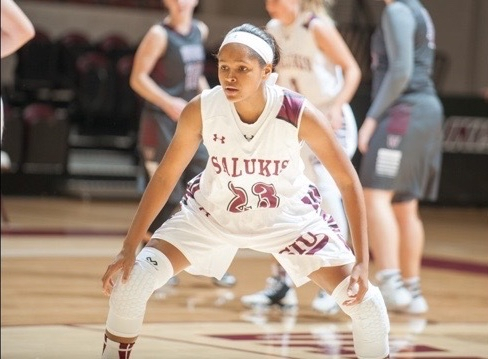 This young lady has already had big moments for SIU. Recently she recorded 13 points, 5 assists, 3 rebounds and 3 steals in a contest. This Freshman will leave her mark at SIU. Amber Jamison has always been a worker and team player. She is a gifted athlete, tremendous defender and capable scorer. Amber is surrounded by accomplished veterans at Northwestern and has had to be patient. However, when her number is called she is always ready. Amber scored 15 points in a win against Evansville and played her usual stellar defense. Amber was subsequently named a starter and proceeded to go off. Amber finished with a team high 22 points against Michigan State while nailing 5 triples -- she was named Player Of The Game. She followed that up with a team high 16 points versus Michigan. 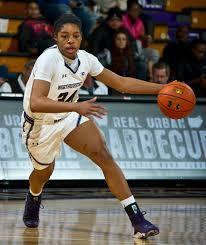 Amber is just getting started at Northwestern. Sparkle Taylor wrapped up a stellar career at UTEP in outstanding fashion. The Flint native was named 6th Player of The Year last year and led the Miners in scoring this year. Sparkle has always been a prolific scorer but she has added strong defense to her game. This young lady did everything asked of her while at UTEP and will be earning a degree. She has exceeded 1000 points in her career and is the 3rd leading scorer in UTEP history. Sparkle is the only player in UTEP history to score 30+ points in consecutive games. 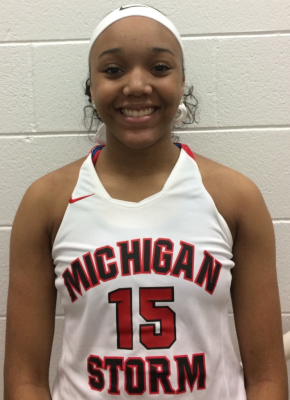 Kudos on an outstanding career..
Sydnee McDonald was one of the smoothest and most explosive scorers on the high school scene in Michigan. 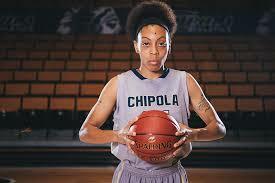 She is still that way at national powerhouse, Chipola. Syd was named Player of The Week after a 3 game stint where she averaged 22 points, 7 rebounds, 1.7 assists and 2 steals per contest. Syd was huge in the Chipola JUCO Tournament run and has picked up a number of D-1 offers from schools all around the United States. You have not heard the last from her by a long stretch. Michele Hayes is dominating the WHAC. The former conference player of the year is simply too much to handle for opponents on most nights. She currently leads the conference in scoring (22 points) and assists (5). Michele set a school scoring record last year by notching 39 points -- she broke her own record this year when she went for 43. A great player but better person. Preseason player rankings have been completed by several outlets and it is an understatement to say that our girls are "represented" in those rankings. The Livingston Daily released their list of Livingston County's Top 5 girls basketball players. Of the five, two are Storm Players. Lexey Tobel (#1) and Graysen Cockerham (#5). The Oakland Press/MiPrepZone compiled a list of the 15 Top players in Oakland County. They also listed twenty other players to watch. Their Top 15 list had six Storm players on it. Kierra Crockett (#4), Ellie Mackay (#5), Amanda Sape (#9), Maggie Rogers (#10), Janara Flowers (#14) and Myra Williams (#15). Among the others to watch, three more Storm players appear; Maxine Moore, Cheyenne McEvans & D'Layna Holliman. State Champs Sports Network compiled a Preseason Top 25 Player Rankings List. They also listed others to watch. Jordan Walker (#11), Krystal Rice (#17), Jaida Hampton (#20) & Lasha Petree (#21). The others to watch were: Adrienne Anderson, Erin Hult, Jessica Moorman, Amanda Sape, Lexey Tobel, Kaylee Wasco, Ro'zhane Wells, Maddie Barrie, Graysen Cockerham, Janara Flowers, Maxine Moore and Aazhenii Nye. Finally, the Detroit Free Press released their preseason Top 100 recently. A number of these players are from the Storm Family: Jordan Walker (#2), Kaylee Wasco (#7), Lasha Petree (#13), Jaida Hampton (#15), Maxine Moore (#16), Lexey Tobel (#18), Destiny Strother (#20), Krystal Rice (#24), Aazhenii Nye (#25), Ro'Zhane Wells (#27), Kierra Crockett (#30), Victoria Perez (#32), Adrienne Anderson (#57), Amanda Sape (#58), Maggie Rogers (#60), Ellie Mackay #64), Maddie Barrie (#65), Mackenzie Harbort (#67), Daija Tyson (#68), Taylor Williams (#69), J'May Simmons (#71), Gabrielle Elliott (#73), Aaliyah McQueen (#75), Cheyenne McEvans (#77), Mahrianna Petree (#79), Sydney Shafter (#80). Our girls are getting it done and are being recognized for their efforts. THE PROOF IS IN THE "PUDDING"
Despite starting the season without a single player ranked in the Top 10 in Michigan for the Class of 2017, Coach Love's 17-U team finished the season being ranked #23 in the United States. https://kennykallina.wordpress.com/2016/08/03/top-club-teams-of-summer-2016/l. The girls went undefeated at the Atlanta Summer Slam and won the prestigious and highly competitive event after knocking off national powerhouse programs, including two that were ranked higher nationally. 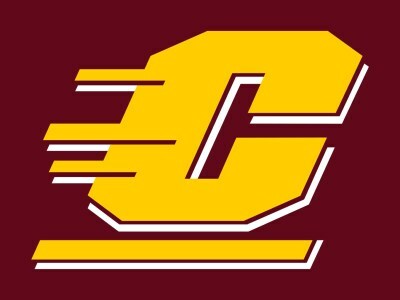 The Club ended the season with the highest national ranking of any team in the State of Michigan and did it in an old-fashioned blue collar way. To date, 6 players from our 2017 Class have committed to play Division I Basketball and three have committed to play at the Division II level. The group played short-handed at the Adidas Uprising Summer Championship but still advanced to the "Sweet 16." We are immensely proud of the girls and hats off to our 2017 Coaches: Love, Stine, Wichtner & Horne. Salute! When our 2018 Team was initally assembled two years ago we knew that it would be a special group. It has proven to be that and more. This group has had tremendous success on the court over the past two years and has racked up a ton of Championships. What is more impressive, and what no other Program in the State of Michigan can say about their Class of 2018, is that eight (8) different players from that roster already hold Division I scholarhip offers and another holds a Division II offer. By any standard, this team has been an unqualified success. These young ladies are hard working and Coach McAllister continues to push them to be their best. When all is said and done we expect that every player on this roster will attend college on a basketball scholarship. These young ladies put in work and they are on their way to being very successful because of their love for the game and their commitment to it. Emaia "Biggie" O'Brien (2021) played "up" in September in Chicago with our 2020 team and was outstanding. She is a quick & exciting guard with a huge heart. 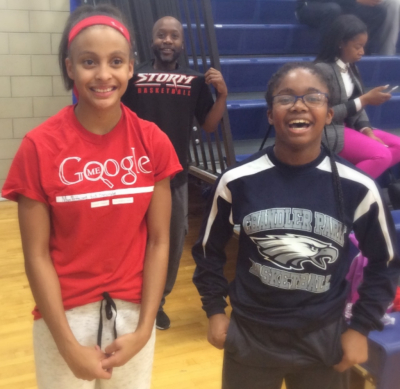 Mya "Money" Petticord is simply the best player in Michigan in the 2022 Class. She has a refined skill set and a work ethic that is second to none. Mya has already caught the attention of college coaches from around the Midwest and has taken an unoffical Big Ten visit. Check out her video from the 5th & 6th grade. Since this video Mya has added a couple of inches to her frame and is only getting better. The Spring Session of the 2016 Season is in the books and it was an unqualified success for the Storm Program. Our players have begun to collect additional scholarship offers and our teams have had success each and every weekend out. 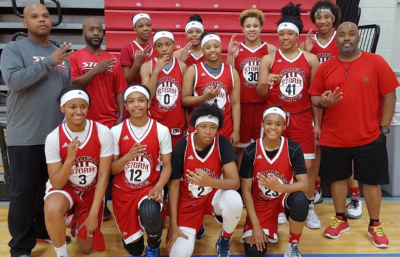 In our inaugral season with Adidas our two Gauntlet teams have made an immediate impact. Storm-Love earned a 10 seed (out of 38) teams in the National Gauntlet Division-- he has a 22-4 record, whereas Storm-Wichtner earned a 2 seed in the Elite Gauntlet Division. In the process these teams compiled a Gaudy record and won championships at big events. Our 3rd 11th grade team (Horne) was beset by injuries and roster turnover but is primed for the second half of the season after recently adding new players. Coach Mcallister (10th) has picked up where he left off last year and his players continue to collect offers. They have won 3 major championships this Spring and have a 30-5 record. 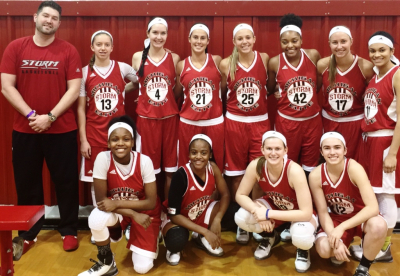 Our Regional 10th grade team (Coach Keiffer) kicked off competition in May and has a championship under their belt. They are a well coached and enthusiatic group with players who have the potential to break out. Our 9th grade team (Coach Taylor) has recently started to dominate. Players in that group have already received offers and several are being recruited by Division 1 Programs. They have 4 championships and are currently 19-5 after starting slowly. Our Program has competed in some of the largest and most competitive tournaments across the United States. Many of our players put themselves on the national "map" by outplaying some of the best players in the country. As a team we definitely represented the State of Michigan well and have defeated some of the best and most storied programs around. Enjoy the video montage. As in past years, this year a plethora of Michigan Storm Family Members garnered a number of post-season accolades. Although the list provided is not complete and will be updated in the near future, we salute these young women for their success this season. Click the button below or go to the News Tab above to read more. Back to the drawing board. This year we made the decision to divide our tryouts by age/grade due to the tremendous turnout in 2015. Although we anticipated a slight increase over last year we quickly reallized that our numbers would far exceed the 2015 turnout. 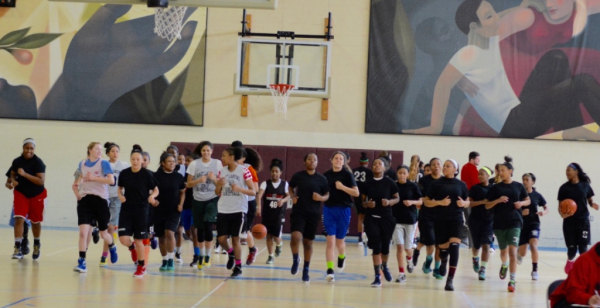 This year 140 players came to tryouts and gave it their all. They participated in advanced drill work and had the opportunity to show their skills during team scrimmages. The decision making process following tryouts was agonizing and we ultimately added two teams to the Program. Our 2017 teams will, as expected, be extremely competitive from top to bottom and our 2018 team (which has 4 2020's on the roster) is expected to build onto the success that they achieved last year. Our 2019 team has the potential to be one of the best groups that the program has ever had but that remains to be seen. We are eager to get the season started and are expecting the best season in our history from top to bottom.